This page was retrieved from https://www.fcd-us.org/childrens-experience-parental-employment-insecurity-family-income-inequality/. 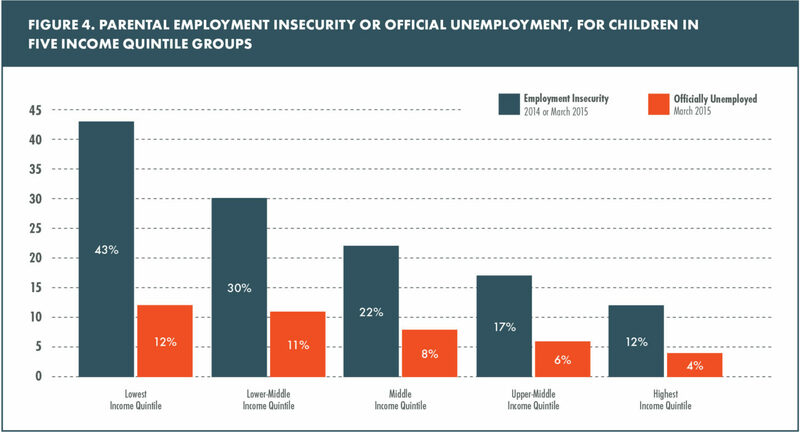 Employment insecurity is a better measure than unemployment. Dramatic declines in family income for children in middle- and low-income families. Income insecurity lessens investment in children and increases inequality. Effective tax policies can reduce the effects of income instability and inequality on children’s educational success and economic mobility. In new research commissioned by the Foundation for Child Development — “Children’s Experience with Parental Employment Insecurity and Family Income Inequality” — Donald J. Hernandez and Jeffery S. Naprierala have created the Index of Parental Employment Insecurity to provide a more accurate picture of the economic health of families and to invest in children’s development. Technology, globalization, and changes in the labor market require a new measurement of employment and the economic stability of American families. Linking parental employment insecurity to family income level better illuminates the economic status of children’s families. 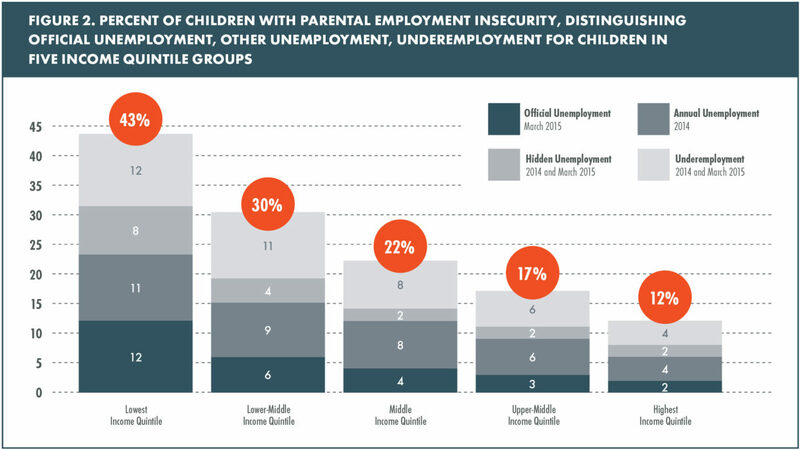 This new index reveals that middle- and low-income parents experienced income insecurity long before the Great Recession in 2008, which greatly accelerated instability and inequality in the resources parents could devote to their child’s development. It points to the opportunity to use tax policy to provide families with the help they need to invest in their children. The official monthly unemployment rate is widely seen as an indication of the health of the American economy and, by extension, the economic stability of the American family. Hernandez and Naprierala find unemployment rates to be a poor measure of family stability in today’s economy as it overlooks realities of the labor market that undermine the confidence and resources of middle- and low-income families. This new index looks at three factors: unemployment; hidden unemployment, as defined by a parent who wanted and was available for work but believed that jobs were not available or they didn’t qualify for an open position; and underemployment, as defined by working part time but wanting a full-time job. Children in middle- and lower-income families were already experiencing high rates of parental employment insecurity and income inequality in 2000, years before the Great Recession. The recession brought additional large increases in employment insecurity and income inequality for such families. By March 2015, children in middle- and lower-income families remained at or above the already high levels of parental employment insecurity experienced in 2000, and by the end of 2014, they had family incomes 10% to 22% below their historic peak in 2000. Research from the Great Depression to the present shows that economic stresses associated with unstable parental work or income loss can be demoralizing for parents and lead to disruptions in daily living. This can result in family conflict, including a negative impact on parenting and, for children, diminished self-confidence, antisocial and hostile behavior, and lower educational attainments. Family income losses for middle- and lower-income families are important because they limit parents’ financial ability to invest in their children’s development. Research indicates that increasing income inequality between 1994-1995 and 2006-2007 was associated with a decline in parental spending on children both in the number of dollars spent by families in the bottom 50% of the income distribution, and as a percentage of total income for families in the bottom 70% of the family income distribution. Spending on experiences and goods — higher-quality early care and education, residence in neighborhoods with better schools, nutritious food and health care, and other activities that foster emotional and cognitive development — build human and cultural capital to ensure children have marketable skills as adults. Personal Exemption for Dependent Children. Valued at $3,950 in 2014, this is the amount parents can deduct from their income tax for each dependent child in the home. By reducing the dollar value of family income, this yields a reduction in federal taxes owed equal to the size of the income deduction multiplied by the marginal (highest) tax rate paid by the family. Thus, the maximum value of the tax reduction for middle-income families experiencing a marginal tax rate of 25% was only $988. Child Tax Credit (CTC). This credit benefits a very large number of families with children. In 2013, about 38 million families received as much as $1,000 per child in the form of a child tax credit. Changes in the CTC between 2000 and 2014 acted to offset a portion of the income decline experienced by the three lowest quintiles of the family income distribution. However, the largest offsetting effect for fully eligible families was only $290 per child, while the largest effect for the small number of families shifting from ineligible to fully eligible was $1,000 per child. The offsetting effect of the enhanced value of the CTC was important for families, particularly those who experienced the full increase, but this was a comparatively small proportion of middle- and lower-income families. Earned Income Tax Credit (EITC). This is one of the largest programs providing economic resources to low- and middle-income families. In 2011, 21 million families with children received EITC benefits, with a value of $3,057 (inflation-adjusted 2014 dollars) on average. In any given year, the EITC provides substantial economic resources to families receiving the benefit, but since the value of benefits did not change between 2000 and 2014, the EITC did not act to offset the large income declines experienced by children in middle-, lower-middle- or the lowest-income families. Public policies that address income insecurity — such as by helping parents regain employment or develop income stability and growth — are essential to ensure families can provide their children with the opportunity to achieve the American Dream.